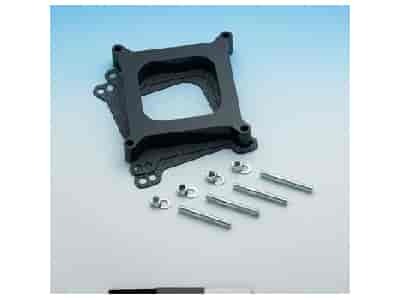 Manufactured from advanced phenolic thermoset plastic and engineered to withstand extreme high intake manifold temperatures, these spacers insulate and reduce heat flow to the carburetor, keeping it cooler to allow a denser fuel mixture to enter the engine and produce more horsepower. Available to fit the standard Holley/Carter and Quadrajet 4-barrel bolt pattern in your choice of open center or 4-hole straight bore design. Complete with gaskets, studs, nuts, and washers. A must for any serious racing enthusiast.